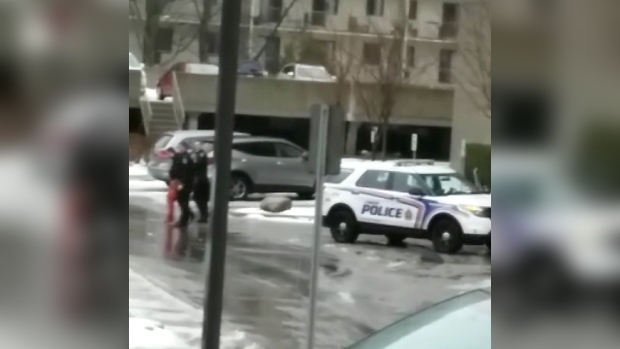 London police have arrested three men who allegedly fled after a home invasion in the city's south end. Officers responded to a 911 call shortly after 1 p.m. for a home invasion-style robbery at a home on Upper Canada Crossing. According to investigators, two men armed with weapons had forced their way into the home. When police arrived, the men fled in a vehicle and officers followed them northbound, during which a cruiser was damaged byt the suspects' car. Once the vehicle arrived in the area of Wonderland Road and Proudfood Lane three males were seeing fleeing from the car. All three were arrested without incident and no one was injured. The investigation is ongoing and police are asking anyone with information to call 519-661-5670 or Crime Stoppers at 1-800-222-TIPS.